This was an anthology book of sorts, that showcased different artists and writers, telling various Wonder Woman tales. The story we focus on is the one that features Superman fighting a Kryptonite powered Titano. Titano beats on Superman, though it doesn't phase the Man of Steel too much, and Wonder Woman comes along to handle the situation. Another teen character with powers comes along by the name of Star Blossom. She gets in Wonder Woman's way a little, but later they both take down Titano, form a friendship and Wonder Woman explains that all things come in time. Story - 3: I like Gail Simone's writing, but this little tale felt like it belonged in a children's book. Maybe that's who it was geared toward, maybe I'm just cynical. The whole friendship and Wonder Woman's good nature seemed very heavy handed. I chose to think that Superman could have handled Titano, but stepped aside to let Diana help. Not the best use of Superman, I hate when a writer uses the character, and makes him seem weak and in distress. 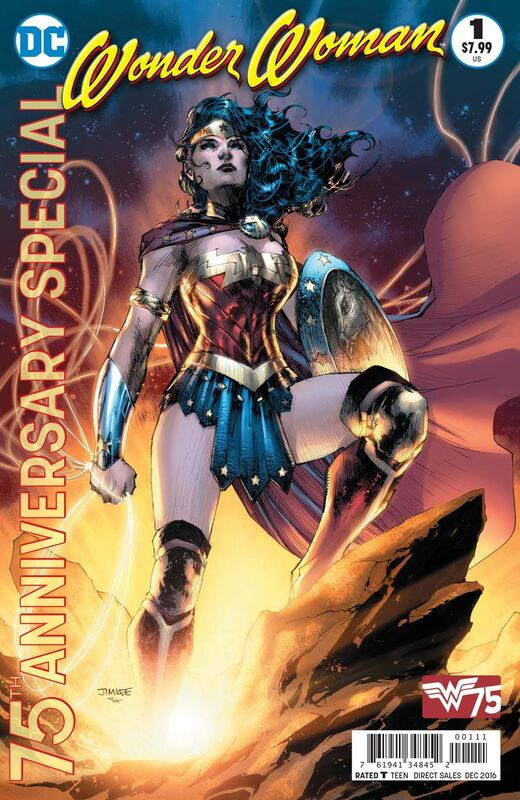 But this is a Wonder Woman book, I suppose she needed to shine in the story. Art - 3: I'm not all too familiar with Colleen Doran's work. It was simply ok, didn't feel too dynamic or anything. I don't like to seem harsh on other artists styles or work, but this didn't "wow" me in any way. Same as the story, it felt and looked rather cheesy!